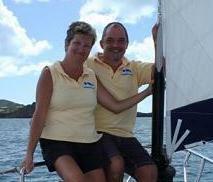 Nick and Kaye are an English couple who are passionate about sailing. They are experienced yachtsmen trained by the Royal Yachting Association of Great Britain (RYA). They have been sailing together for over 20 years in Europe, the Indian Ocean, Australia and their favorite in the Caribbean. With over 12,000 miles sailed in Antiguan waters they invite you to join them aboard JABBERWOCKY for what has been described by guests as “the best day of our holiday” and “an experience we will never forget”.